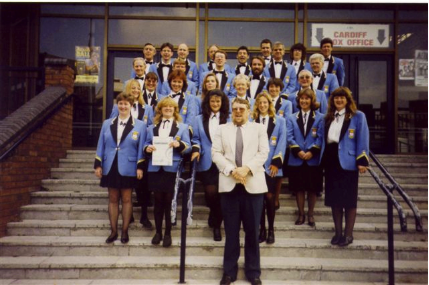 1999 was a very good year for contesting, producing creditable results for both the main and training bands.At the National Qualifying Contest, we came fifth out of fifteen bands. This was a very creditable performance, especially as this was our first year following promotion to the second section. Once again we were successful at the Chichester Music Festival in February. Both the senior and training bands came out winners. In the solo classes, adjudicator Leighton Rich (the conductor of the Hampshire Youth Brass Band) awarded no less than nine first prizes to members of the training band. At the Crawley Entertainment Contest, the prize for the best soloist went to principal trombonist Kevin Webb. Kevin was joined by fellow trombonists Ian Kingshott and Bob Ainsworth, scooping the award for the best Trombone section. Kevin, Ian and Bob played a special arrangement of “I Will Follow Him” from the Whoopi Goldberg film “Sister Act”. To make the performance even more authentic all three trombonists dressed as Nuns. Musical Director John Williams once again came away with the conductors award. At the Southern Counties Autumn Contest in Folkestone the band gained first prize in the hymn tune category with a performance of Holy, Holy, Holy. With our interpretation of Goff Richards “Three Saints” we were placed third overall and John Williams securing the conductor’s prize. Peter Hughes, Peter McGovern, Irene Boyle and John’s wife Mary Williams brought home the prize for the best horn section. Along with our winning performances at the Spring Contest in Brighton and Entertainment Contest in Crawley, this means that the band has walked away with 11 trophies this year alone. This was the band’s most successful year of competition ever. The highlight of our summer season came with our concert in the Chichester Festivities International Arts Festival, at St. Paul’s Church, Northgate on Friday 9 July. There was something for everyone in the concert including music from our recent appearance in BRASSED OFF, music from the big band scene and a very exciting arrangement of Festival Overture by Dmitri Shostakovich. Some of the repertoire that brought the band eight trophies this year was also on display. For the first time ever this year, the band performed at the Chichester Festival Theatre. The band were delighted to take part in the stage version of the hit film BRASSED OFF. The show ran from Tuesday April 13 to Saturday April 17. Our performance was judged a great success from press notices and audience reaction. The show generated a lot of publicity and we were featured in the Observer Magazine. Members of the training band were to the fore during the Solo classes of the Chichester Music Festival. Alex Barron (age 8) was the winner of the beginner class on his Tenor Horn, Ruth Hartley (age 10) came first in the grade one class on cornet and Rebecca Williams (age 9) was given special mention for her tenor horn playing in the grade two class. In the band and ensemble classes, the training band gained first prize in the Brass Band Youth Section, this was the first competition the band had ever entered. 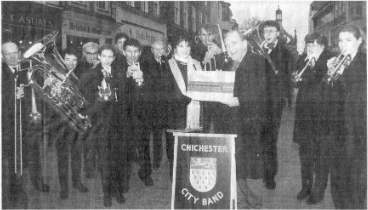 Chichester City Band had a good 1997 as the band celebrated its centenary year. Now aged 101, the band look set for continued success and growth. 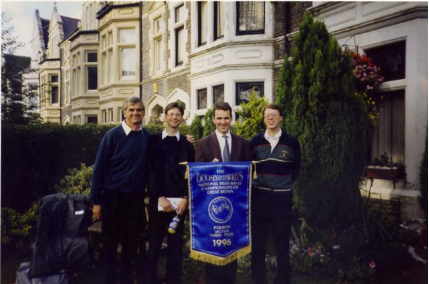 1998 has seen musical director John Williams take the band to new heights of musical achievement.The band’s competition success started with an Outstanding classification for their performance in the Chichester Music Festival, and the band’s ten piece were awarded the Mayor of Chichester’s Trophy for the most outstanding performance in the orchestra and band classes of the festival. In March, the band participated in the qualifying contest for the Brass Band Championships of Great Britain, at the Towngate Theatre, Basildon. Due to our creditable performance at Basildon and a run of consistently good results, the band was promoted to the second section This promotion represents a rapid growth in the bands fortunes as only two years ago the band was still in the fourth section. Now the step to championship section does not seem as remote a possibility as once it was! In April, the band’s run of success continued in the second section of the Southern Counties Amateur Bands Association Spring Contest, at the Brighton Dome. The band came away with a hat-trick of prizes. The band was awarded first prize for a performance of Goff Richards suite, Three Saints. Musical director John Williams was awarded the conductor’s trophy. The band was also presented with the Bob Ayling Memorial Trophy for the best trombone section. The award for the best trombone section was particularly poignant for the band. This trophy was being presented for the first time in memory of Bob Ayling, who was a trombonist with the Chichester City Band for fifty years. The trophy was presented to trombonists Kevin Webb, Fred Burrows, Ian Kingshott and Don Webb by Mrs. Barbara Ayling. At the SCABA Entertainment Contest at the Hawth Theatre Crawley in May, the band scooped another hat-trick of awards. The band were awarded first prize, the trombones secured the award for the best trombone section with the Ted Heath number “Hot Toddy and musical director John Williams came away with the compere’s trophy. Adjudicator Gordon Higgingbottom praised the band for “putting on a good show” and felt they “played with conviction”. 1996 was a very memorable year for the city band. For the second year running, we qualified for the national finals. Having qualified at the regional contest at the Watford Town Hall in the spring, where we put in a good performance of the test piece ”Mexican Fiesta” by Ronald Hammer. We achieved a third place, much to the delight of the band and our Musical Director Nigel McDonald. This meant Nigel would be taking his band back to the country of his birth place Wales. The National Brass Band Championships Finals this year were being held at Cardiff International Arena in September. The test piece from this year was the “Malvern Suite” and quite a different challenging piece to the previous year’s piece. The band prepared for the contest with extra rehearsals at the same time keeping up with concert engagements. The reward for all this hard work was that sufficient funds had been raised for the band to be kitted out with a new sky blue uniform which became available the weekend before the finals. On the Friday afternoon we travelled down by coach to Wales and stayed two nights in Cardiff, on the Saturday morning we made our way down to the Cardiff International Arena and we drew number 4 in order of play. Performing for the first time in our new blue uniforms, we had qualified for the final for the second time. We were pleased with our performance and had good adjudicator’s remarks and to our delight we finished in the frame in third place. The prize we received was a cheque for £500 (our biggest ever cash win), plus the Boosey&Hawkes embroidered blue banner. After a Saturday night of celebration. It was back to a concert performance on the Sunday as it had been arranged for us to visit Nigel’s home town of Merthyr Tydfil. Where he had grown up and had played with the Salvation Army band. On the Sunday afternoon we played a joint concert with Nigel’s old band in front of his Mother, Father and many relatives of which he was very proud to have the city band perform in his home town. We believe that this contest result was the best result ever achieved even though the band had some fine results in the 1920’s and 1930’s. But we do not have any contest records for this period or surviving band members. 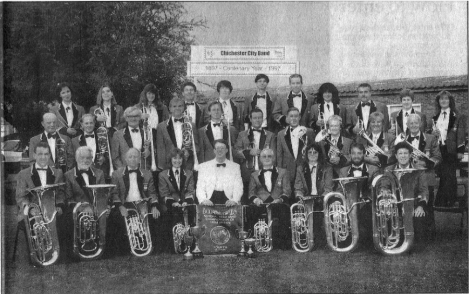 1995 was one of the best and most memorable years in the Chichester City Bands 98 year existence. The band competed at the Watford Regional Contest in February and finished third, which qualified them for the Wembley finals for the first time ever. Earlier in the year at the A.G.M the Progress Cup vas awarded to Don Webb. Very good news arrived in August when the band won an award of £15,000 from the Foundation for Sports & Arts. This was followed in November with the fantastic news of an award from the National Lottery of just over £62,000. This money is solely for the purchase of new instruments and cannot be used for any other purpose. A big vote of thanks to Dr Fred Burrows, trombone player in the band, for his work on the form filling that led to the financial success. A good result was achieved at Wembley when the band reached 7th place out of 18 bands in the section. 1992 has started well for the band as they have gained promotion within SCABA to the 2nd Section and are looking forward to a happy and busy year ahead. They have already competed in the Regional finals at Watford as well as Brighton and the Entertainment Contest at Crawley. 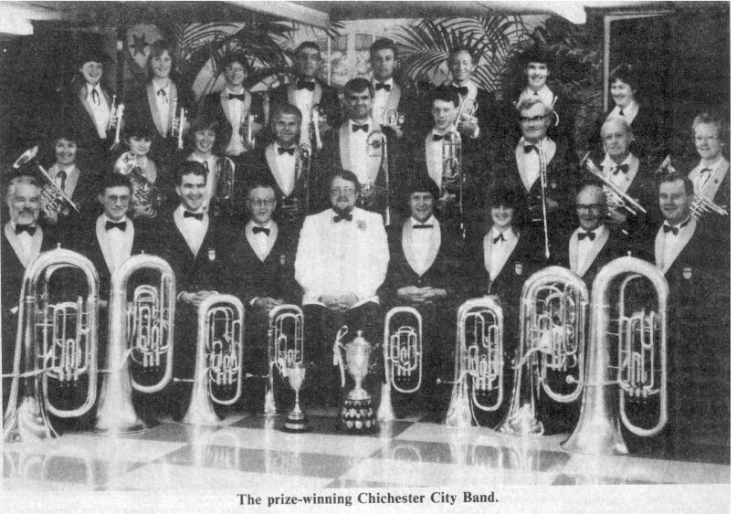 The Chichester City Band, having completed a very successful and satisfactory 1991, saw the band competing in five brass band contests with very pleasing results, which included a 2nd place result at Brighton and also taking part in the Boosey & Hawkes National Regional Contest at Watford for the first time since the early 1970’s.